← Why is General Brooks making trouble for Michael Yon? 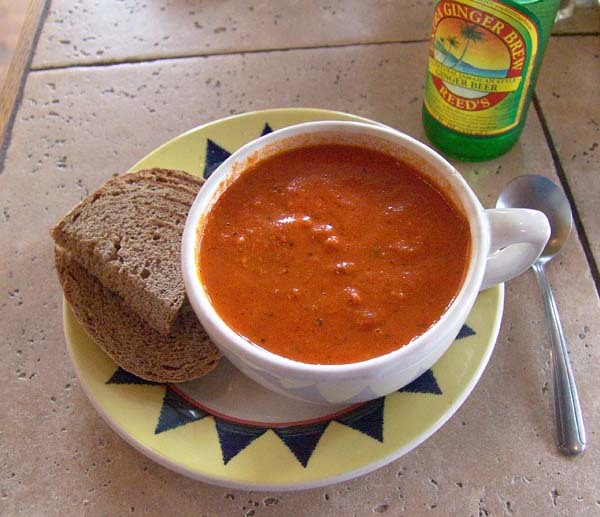 Sally Walker’s Cafe Del Sol in Floyd Virginia offers home made soups that hit the spot. I enjoy their sandwiches and salads every week, but it is the soups that bring a smile to my face and restore my sense of harmonic balance. Sally prepares these soups from scratch and her friendly staff makes sure that we get served with care. The net result is comfort and contentment. 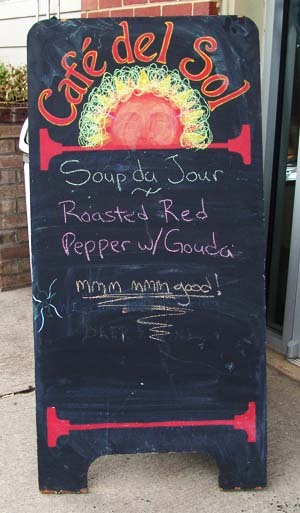 Saturday’s special soup was roasted red pepper with Gouda cheese. It was as tasty as it looks. Life should always be so good! This entry was posted in Food and Drink and tagged Cafe del Sol, Floyd food, good food, roasted red pepper soup, Sally Walker, soup. Bookmark the permalink.